Color is back in 2019 Home Color Trends! After the gray trend of the last nine years, I’m seeing home color trends moving toward more color and warmer colors. Look in accessory catalogs, on home decor blogs, and in paint company inspiration palettes to see bold colors, warm earthy tones, and navy being featured. Remember, trends last 7-10 years, and gray is on its way out. Here in the midwest, we are a little slower to catch up with color and design trends. Along the west coast in California and on the east coast in places like New York these color trends are here. If you’re a late bloomer, maybe you’ve just finished painting your walls gray. Don’t despair! Bringing in colorful, new accessories can brighten your home and give it a fresh update until you paint again. On the other hand if you’re ready to get rid of the gray and not sure how to transition to color, read on. One way to create a new color scheme without gutting and starting over is to find a pillow or fabric with new colors that complement your current color scheme. 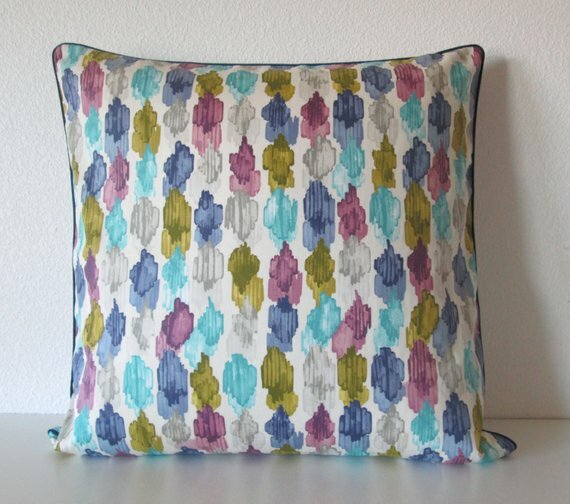 This pillow by chicdecorpillows incorporates a blue-gray in the pattern along with yellow-green, aqua, and the on-trend navy I’m seeing in so many accessories now. The gray color scheme was originally intended for consumers to use pops of color to brighten up the gray backdrop. Many homeowners gravitated toward monochromatic shades of gray and neutrals with no colorful accessories or artwork anywhere. If your color scheme falls into this category, a simple way to freshen your design would be to add those intended pops of color. If you still shy away from bold, saturated colors, consider navy to accessorize and add color to your home. Navy is the new neutral of neutrals, so it’s a good way to start experimenting with color if your home leans toward whites, grays, and other “safe” colors. Scour home decor catalogs for accessories, scan Pinterest to see how others incorporate navy, and seek help from a color consultant if you need help. After the cool gray trend, consumers are wanting bolder colors and warmer environments. 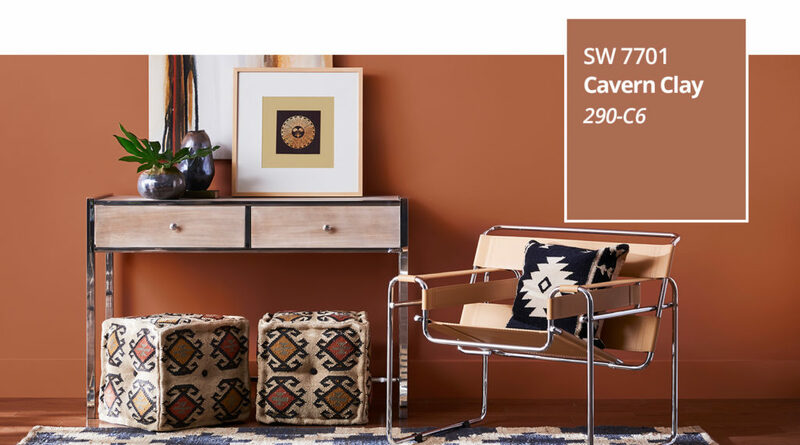 Home color trends are moving to ward earthy colors, as demonstrated by Sherwin Williams 2019 Color of the Year, SW 7701 Cavern Clay. Their website descriptively states: “A warm terracotta color with ancient, elemental roots, Cavern Clay is a nod to midcentury modern style, but with the soul of the American Southwest, which together creates the desert modern aesthetic.” Bringing these colors into our homes reminds people of varying landscapes, the freedom to explore, and a serenity only nature can offer. Geometric patterns and layered textures and accessories create a richness that invites. Wallpaper is back in subtle and creative ways to enhance the feel of our spaces. 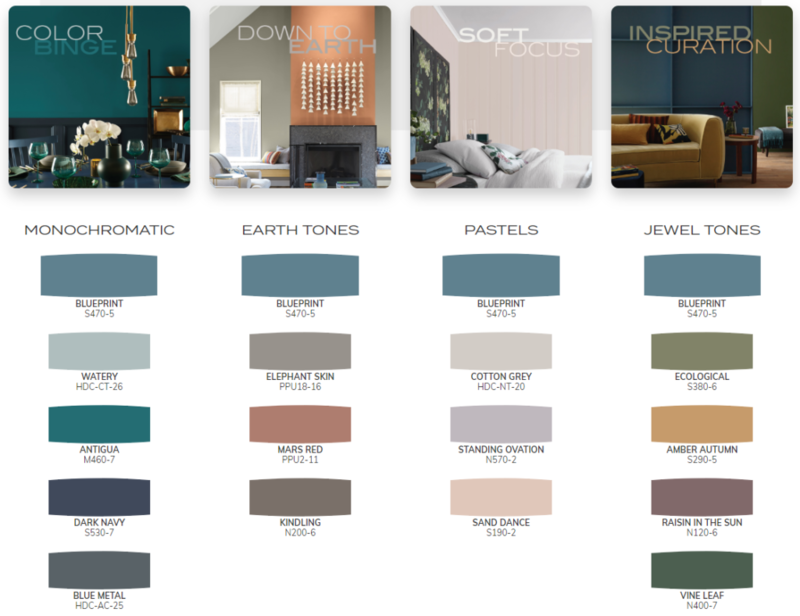 Behr describes their 2019 Color of the Year, S407-5 Blueprint, as “An honest, approachable color that conjures up the blueprints builders rely on to bring architectural designs to life, Blueprint creates a space where you can build your own reimagined life—where awareness of what we want to build for ourselves can transform into action.” The saturated blue-gray surrounds consumers and invites them to be the creator of their spaces. The names of their four curated color palettes – Color Binge, Down to Earth, Soft Focus, and Inspired Curation – demonstrate how saturated colors dominate the new home color trends. In the end, many people still prefer neutral walls with accessories, rugs, and furniture bringing in color. The trend for neutral walls leans to greige, which adds a touch of warmth to the grays we’ve been using. Greige paints a whisper of color to freshen up and brighten, while still providing the backdrop for artwork and color. 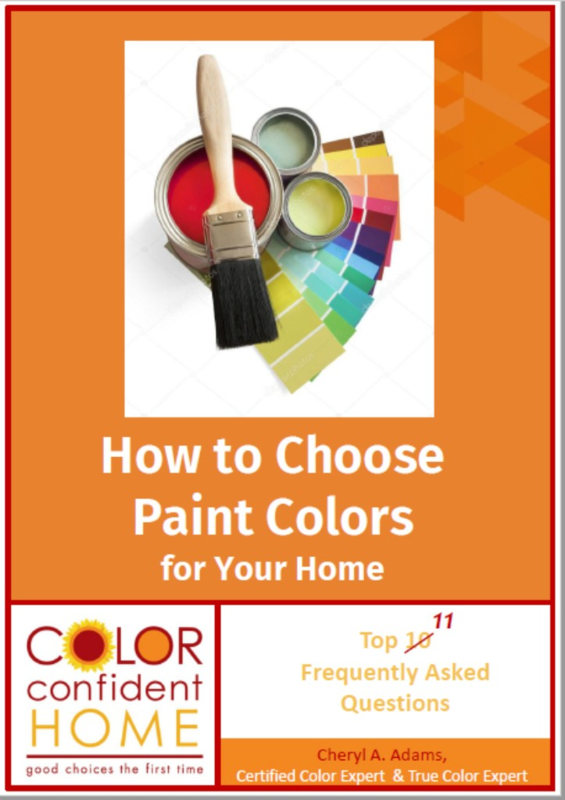 If you need help figuring out the best color for your walls or deciding on an updated color scheme, contact me so you can choose the right colors the first time!